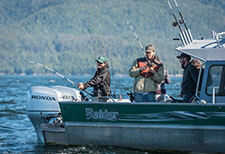 Private charters in Ketchikan's #1 attraction with Baranof. Every year, over a million visitors arrive in Ketchikan. 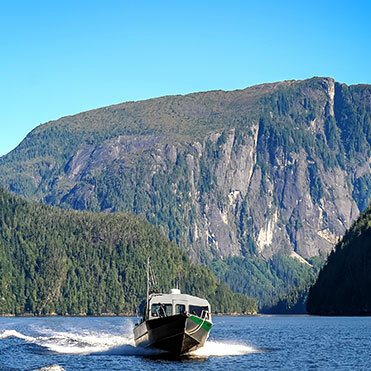 A large portion will take a sightseeing excursion to Rudyerd Bay in the Misty Fjords either by chartered boat, seaplane or high-speed catamaran. The pristine wilderness landscape and unique glacier-sculpted mountain and rock formations make this national monument a must-see for anyone that passes through Southeast Alaska. While Rudyerd Bay provides the most intimidating scenery with the least amount of travel time, and is an excellent addition to your Southeast experience, the entire area provides majestic wilderness exploring opportunities for those that wish to tread where few others have. 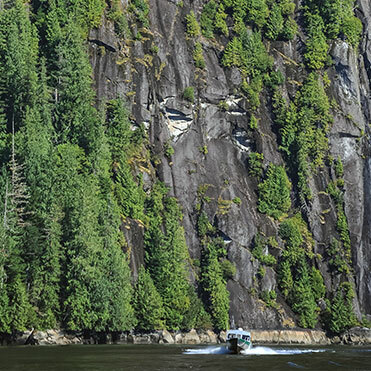 If you seek the path less traveled, the 2.3 million acres that comprise the Misty Fjords National Monument has a location perfect for you on your private charter. Whether camping, kayaking, hunting, fishing, or sightseeing, there are any number of excursions available that will enable you to enjoy the natural wonder of our National Monument. Here at Baranof, we consider ourselves uniquely suited to provide a wealth of these opportunities to anyone looking for a private, personalized adventure through this rugged landscape in complete comfort. Whatever your idea of a great day in the Monument, we are able to provide a chartered boat that can provide it, or introduce you to one of our recommended seaplane operators. 30 ft. - Our 30 ft. 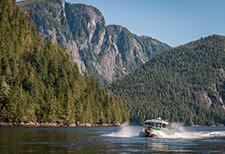 Raider cabin-cruisers are ideal for a day or overnight excursion to the Misty Fjords. Complete with heated cabin and head, this vessel allows you to explore every bay and inlet that strikes your interest without ever having to set foot on shore. With an open aft deck for unobstructed viewing and twin 225 hp Hondas for swift travel, your options are limited only by your own imagination. 24 ft. - Our standard cabin-cruisers are a less expensive version of the 30 ft., which are a little slower and don't have a built in head. Designed for use in the protected waters of Southeast Alaska, covered bench seating replaces this space. Picnicking on a remote beach in the Fjords is an excellent option enjoyed by guests chartering these boats. 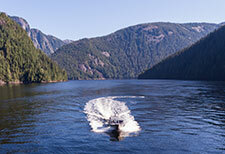 Our Misty Fjords charters focus on sightseeing. Dropping a line and pulling up halibut, lingcod, or snapper, along with a beach stop at our remote campsite for a gourmet meal, rounds out the day. It's your boat, however, so get with the us and plan out a day that best suits your needs. Extending 2.3 million acres across Tongass National Forest, Misty Fjords is the largest wilderness in Alaska's national forests and the second largest in the nation. Granite walls from sea level to 3000ft. Sheer cliffs and thick rainforests comprise Punchbowl's breathtaking landscape. A pillar of basalt in the Behm Canal. New Eddystone Rock was part of a volcanic vent where magma rose repeatedly to the surface of the earth. Most popular Misty Fjords destinations. The scenery is stunning, with dramatic thousand-foot waterfalls plunging down covered cliffs to the water below. To view more of our popular private charter choices. The area we now know as Misty Fiords Wilderness Area has long attracted attention because of its unique geology and outstanding beauty. In 1793, Captain George Vancouver took note of a dramatic geological formation and recording in his log; We again saw the remarkable rock resembling a ship under sail… Soon after this observation, he described and named New Eddystone Rock. Sometime between 1943 and 1945, the US Forest Service designated 93,540 acres in east Behm Canal as the Walker Cove & Rudyerd Bay Scenic Area. In the mid-1970s, a Ketchikan group associated with the timber industry recognized the likelihood of future preservation of the area. They organized as Citizens for the Management of Alaska Lands (CMAL) to deter withdrawal of land with significant amounts of harvestable timber in the scenic area. They proposed the designation of Granite Fjords Scenic Area, within the Walker Cove & Rudyerd Bay Scenic Area, but smaller in size. However, political events would soon dramatically changed the size and status of the designated scenic area. The genesis of this change started when oil was discovered on the North Slope. Alaska’s Natives who had long sought compensation for lands taken from them, decided the time was right to be more aggressive about obtaining a settlement of land claims, lest they lose potential selections to development interests. The result was (ANSCA) the Alaska Natives Settlement Claims Act passed by Congress in 1971. Also looking to the future was the mining industry. Realizing that many potentially rich mineral laden lands might be conveyed out of the public domain, many mining companies embarked on an aggressive exploration program in Alaska. As a result of this activity, in 1974, the largest deposit of molybdenum in the world was found between Smeaton Bay and Boca de Quadra at Quartz Hill in what is now Misty Fiords Wilderness Area. It is estimated to contain 10% of the free world’s known reserves of the ore. The mineral deposit was discovered by U.S. Borax, a subsidiary of Rio Tinto Zinc, a London based conglomerate. If developed it would be the second largest open pit molybdenum mine in the world, second to a mine at Climax Colorado. If developed, it was projected to produce 80,000 tons per day and create a pit 2 miles by 1.3 and 1,875 feet deep. A support community nearby, presumably at tidewater was projected to have 5,000 residents. The discovery of the large mineral deposit generated much interest in the Ketchikan area, and supporters and opponents organized. The stage was set for a contentious political debate locally and nationally. The vehicle for this battle would prove to be the Alaska National Interest Lands Conservation Act, (ANILCA) which eventually passed and created Misty Fiords Wilderness Area. ANILCA was an act created as a result of ANSCA. ANSCA had a provision which directed the secretary of the interior to withdraw up to 80 million acres from development for conservation purposes. These lands were referred to as d-2 lands from Section 17 (d) (2) of ANSCA. The lands would be available for potential congressional designation as national parks, wildlife refuges, wild and scenic rivers or national forests. Such designations were to be made in 9 months and enacted into law within 5 years or become available for development. So it was within this window of 5 years that a contentious battle between wilderness advocates and development proponents was waged over Alaskan lands, not only in Alaska but throughout the country. Prior to the discovery of molybdenum in east Behm Canal, a group of citizens in the Ketchikan had asked the U.S. Forest Service for protection for the area around Walker Cove and Rudyerd Bay for its scenic values, but one much larger than the designated 93,540 acres. The Ketchikan area residents who drew up the proposed boundaries included Dixie Baade, a public health worker, Margaret Piggott, physical therapist, Roger Lhorer, Tyee Air dispatcher, Terry Wills, commercial pilot and beach salvage logger, Lawrence (Snapper) Carson, fish tender owner/ operator, Malcolm (Buster) Doiron, timber scaler and his wife Dee, Bob and Edith Nelson owners of Thayer Lake Lodge on Admiralty Island and Orvel and Carmen Holum. Orval worked at Ketchikan Public Utilities and Carmen was a public school teacher. Originally the group referred to the area as East Behm Canal, but decided a name with more allure was needed. Buster came up with the name Misty Fiords. A common spelling is fjord, however, the U.S. Government uses fiord. The Tongass Conservation Society formed in about 1968, including some of the individuals listed above, mainly to address timber harvesting issues and the preservation of key areas for recreation. 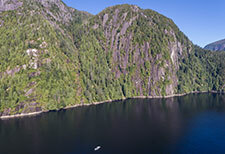 The effort to establish Misty Fiords was part of that process. However, it soon became concerned with the molybdenum discovery on Quartz Hill and realized the potential negative impact on the area and threat to its Misty Fiords proposal. Consequently, TCS took a position of opposing the mine in concert with promoting Misty Fiord as a wilderness area. When U.S. Borax begun to make plans to obtain the necessary permits for the mine, the Ketchikan business community and many in the labor force enthusiastically endorsed the mine and lobbied the U.S. government to issue the required permits. In a climate of generally unbridled enthusiasm for the mine, supporting Misty Fiords was a very unpopular in Ketchikan. Several outspoken advocates of Misty Fiords were fired from their jobs and several of us with businesses, received economic retaliation. A great deal of support for Misty Fiords came from outside the local area. A conservation movement had evolved in the early 1970s in S.E. Alaska Each of the major communities had developed a conservation organization and together they had formed a Juneau based umbrella organization, the Southeast Alaska Conservation Council . SEACC became a lead organization against the mine. Also, joining the effort was the United Fishermen of Alaska and its Ketchikan affiliate, the Southeast Seiners Association. The area of the proposed mine was adjacent to two major watersheds, both with rich salmon runs, the Keta/ Blossom watersheds emptying into Boca de Quadra and the Wilson River running into Smeaton Bay. It was anticipated that the effluent from the mine would create major environmental damage. US Borax projected a mine life span of 70 years during which time, 12 mile long Smeaton Bay would be filled with tailings. Misty Fiords proponents hoped to use ANILCA as a vehicle to protect the area. However, ANILCA directed that preserves were to be selected from “non- allocated” lands, of which there was much in the interior. However, in S.E Alaska, almost all of the federal land was within the Tongass National Forest, obviously “designated land”. However, we at SEACC (I was a founding director) decided to take a “long shot” and ask for Misty Fiords to be taken from the Tongass National Forest. ANILCA became a national issue and the battle in Congress heated up. Alaska conservation and commercial fishing groups teamed up with a coalition of national conservation groups including the Sierra Club and the Wilderness Society. The group became known as the Alaska Coalition which coordinated the lobbying effort. Supporters of the mine had a strong economic pitch to the business community in Ketchikan. A mine of this magnitude would bring considerable growth and jobs to the area. Conservationists and many in the outdoor recreation business countered that the large influx of people into MF and the wastes from the mine would be environmentally disastrous to the area. Commercial fishermen made a powerful case that although the mine might bring jobs to the area, their jobs were at stake. I was one of several fishermen who went to D.C representing the United Fishermen of Alaska to lobby during what was called “d-2 mark-up.” Senator Ted Stevens was a strong opponent. It didn’t hurt the development oriented groups that another powerful supporter was Ronald Regan soon to be president and a former actor on “Death Valley Days” whose main sponsor was U.S. Borax. The battle dragged on for years. The sunset provision of the d-2 of ANSCA was set to expire on December 18, 1978. 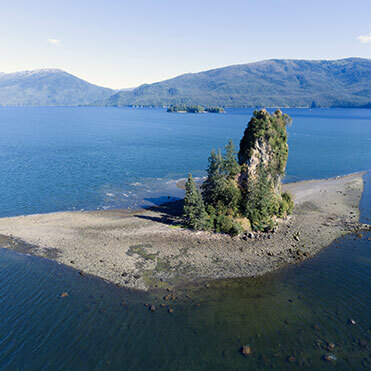 When it looked doubtful that an agreement on ANILCA would be reached, President Carter used the Antiquities Act to create 56 million acres as National Monuments by executive order on December 1, 1978, including Misty Fiords and Admiralty Island. President Carter was a staunch supporter of Misty Fiords. In later years, one of the passengers on my tour boat visiting Misty Fiords introduced himself as an aide who had worked with the President in developing his monument designations. He said that he spent an evening with the President on the floor of the oval office pouring over maps of Misty Fiords. Carter’s action caused wide protests across Alaska and he was burned in effigy in Fairbanks. In early November 1980, Carter lost re-election to Regan and the Republican Party won a majority of seats in the Senate. Conservationists realized that Regan and Congress could undo the designations created under the Antiquities Act and that it might be prudent to accept the legislation that they previously rejected, before the new congress and president was sworn in. ANILCA was passed in November of 1980 providing varying degrees of protection to over 157,100,000 acres of land from development, including 2.3 million acre Misty Fjords Wilderness Area. However, compromise was need to finalize the legislation. The wilderness area was created like a donut with an enclave of 152,610 acres within the monument for the mine exclusion. The price of Molybdenum has never risen to a level that would justify developing the mine. Today, the site is owned by Canadian mining company Caminco. Dale has had a long history in Misty Fiords. As a youngster on the family commercial troller, he spent several summers fishing in the area in the 1950s. Employed as an ADF&G fisheries biologist, he worked for a considerable amount of time in MF over a 10 year period. 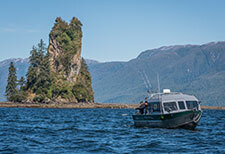 For 15 years, he gillnetted salmon primarily at Tree Point in the southern reaches of Misty Fiords. 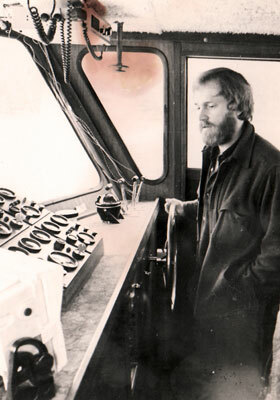 Dale pioneered scheduled scenic cruises to Rudyerd Bay in 1977, and operated until 1999. He has written a soon to be published book, Alaska’s Inside Passage.